ProOmega®-D provides exceptionally high levels of the omega-3 essential fatty acids EPA and DHA‚ in addition to 1000 I.U. of vitamin D3‚ in one delicious serving. Vitamin D3 (or cholecalciferol) is the natural form of vitamin D produced by the body‚ and is better absorbed and utilized than other forms. ProOmega D provides a high concentration of health promoting omega 3 fats with added natural vitamin D, both required nutrients. ProOmega D supports strong immune function and bone health. Two soft gels daily‚ with food‚ or as directed by your health care professional or pharmacist. Ingredients: Purified deep sea fish oil (from anchovies and sardines)‚ soft gel capsule (gelatin‚ water‚ glycerin‚ natural lemon flavor)‚ natural lemon flavor‚ d-alpha tocopherol‚ vitamin D3 (cholecalciferol in olive oil)‚ rosemary extract (a natural preservative). Their fish oil is manufactured in a 100% oxygen-free environment to preserve its unique freshness. Molecular distillation removes any potential impurities down to the parts-per-trillion level. Certificates of analysis are available upon request with Nordic Naturals. Their fish oils surpass all national and international standards for purity and freshness. All Nordic Naturals products are third-party tested for freshness and purity. Their pure and fresh fish oils are manufactured from the highest quality raw material, and contain the triglyceride form of EPA and DHA for optimized absorption. Nordic Naturals products are used and recommended by leading doctors and research institutions around the world. Nordic Naturals' environmentally responsible policy ensures that 100% of their fish is utilized for human or animal consumption. 100% of their fish is sourced in accordance with the Norwegian fisheries management system, which has been a model for the sustainable harvest of marine life for over 30 years. What Type of Fish Does Nordic Naturals Use In Their Products? Since our founding, Nordic Naturals has always been committed to sourcing only fish species that are flourishing and only from waters that are not threatened by overfishing. Nordic Naturals cod liver oil products are made from 100% wild Arctic cod (Skrei) that are sustainably sourced from the Norwegian Sea. All other Nordic Naturals products are made from wild, sustainably sourced sardines and anchovies from the South Pacific Ocean off the coast of Peru. For more detailed information about our fishing practices and the regulations of the Norwegian Government fisheries management system, please visit: planetnordic.com. How Is Mercury (and Other Tixins) Removed From The Fish Oil? Molecular distillation removes impurities (heavy metals, dioxins, etc. ), saturated fats, and other undesirable organic compounds. Molecular distillation is gentle with exceptionally low heat residence time and is performed in a vacuum to further reduce heat requirement. All time and temperature specifications are proprietary, but we can assure you that no trans fats are created during any of our distillation processes. Any potential impurities and saturated fats are distilled out of the oil, leaving only the key beneficial components of the fish oil. Flash distillation accomplishes the same thing as molecular distillation, but utilizes steam rather than a vacuum. The process used depends on the intended concentration of the fish oil. Molecular distillation is used for all of our fish oil products. Flash distillation is used for our non-concentrated fish oils. Independent lab results consistently show that these processing techniques deliver oils of exceptional quality and freshness. Certificates of Analysis are available upon request. Nordic Natural's only focus is to ensure delivery of ultra pure, fresh and health promoting omega essential fatty oils that have a taste great, and are free from any environmental toxins. All Nordic Natural's products are manufactured in Norway where they adhere to the highest manufacturing standards that guarantee exceptional purity and freshness of all theri supplements. Nordic Naturals only uses wild fish like arctic cod, mackerel, sardines, and anchovies. They are low on the food chain which minimizes the potential of impurities. They are also and naturally high in Omega 3 EFAs essentail fatty acids. They have developed and patented natural fruit flavored capsules in a wide variety of shapes and sizes, in particular, small chewable strawberry capsules ideal for children, and even liquids. They make exceptionally high quality fish oils in their natural triglyceride form to maximize absorption and results. Their goal is to keep the oil's natural constituents to the greatest degree possible. In addition to EPA and DHA, Nordic Natural's formulas also include Docosapentaenoic Acid (DPA, C22:5n-3), Alpha Linolenic Acid (ALA, 18:3n-3), as well as some monounsaturated and saturated fats found naturally in the oil. The most common fish oils are the "18/12" oils, which are 18% EPA and 12% DHA. This formula is ideal for maintaining healthy levels of the key nutrients EPA and DHA. Since it is already in its natural form, an 18/12 oil does not need to be molecularly distilled, unless its source is impure. Flash distillation, a gentle and leading-edge oil processing technique, cleanses the oil while leaving the molecules untouched. For higher concentrations, molecular distillation is used to increase the levels of the two key fatty acids EPA and DHA. High concentrates can be in their natural triglyeride form or in an ethylester form. Nordic Naturals uses only the triglyceride form of fatty acids since they offer higher stability and bioavailability. Concentrates lend themselves well for specific therapeutic dosing. In the example of pregnant and lactating women, a concentrated DHA supplement can easily meet a woman's need for brain and nervous system support, without the vasodilation effect of EPA. Higher EPA formulations target heart health and immune system support. 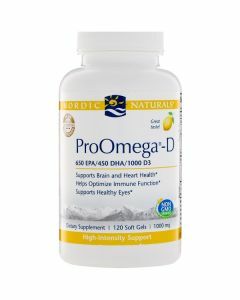 Concentrations of both EPA and DHA are ideal for protocols that may require high dosages of Omega-3 in a balanced form. EPA builds prostaglandin PGE-3, which is anti-inflammatory and promotes vasodilation. DHA is needed for pregnant or lactating women, children's developing brain and nervous systems, periods of high mental stress and any signs of forgetfulness. Both EPA and DHA maintain membrane flexibility, which supports the cellular intake of nutrients, and the elimination of toxins. EPA and DHA contribute to structural parts of the cells and facilitate electrical channels on the membrane (neural transmission). Evening Primrose Oil and Borage Oil supply different ratios of GLA (Omega-6) and are rich in Omega-9, otherwise known as Oleic Acid. GLA nourishes the skin and promotes prostaglandin PGE-1, which is also anti-inflammatory. Many doctors prefer to supply GLA with a fish oil to maximize the health promoting enzymatic pathways and prevent serum buildup of pro-inflammatory Arachidonic Acid. Nordic Naturals originated in Arctic Norway. This is where their founder, Joar Opheim was raised. Where he grew up fish oil is a part of everyday life. Then in the 1980's when he left there he came to California to study. Joar couldn't find the quality of fish oil anywhere that he was used to. He was inspired by his personal experience to start developing many patented fish oil technologies. He evaluated flavor and taste, as well as how it was delivered and processed. So it was that Nordic Naturals was born. It was based on all the things that Joar had learned. They use ethical and socially responsible practices. They are environmentally conscious. They are proud of their focus on their philanthropic partnerships, corporate transparency, and how they stress education. They are actively involved in peer-reviewed clinical studies that are recognized by many leading experts all over the world. Nordic Naturals has more than 150 products that have many different flavors and a variety of concentrations. They are consistently selected by independent research institutions and universities like NIH, National Institutes of Health, Harvard University, Columbia University, Stanford University, Duke University, UCLA, and Cedar-Sinai Medical Center. They have 25 studies published, including 15 clinical research studies, and over 30 in progress. They sell their line of essential fatty acids supplements in over 30 different countries all over the world.